We hope you can join us over the weekend! Service of Reflection, 10am at St Saviour’s. Town-wide March of Witness. 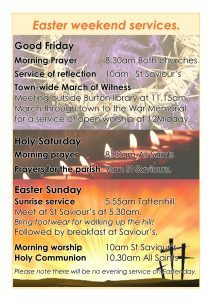 Meeting at Burton Library at 11.15am, outdoor service at the War Memorial at 12midday. Sunrise Service. 5.55am at the top of Battleshead hill, Tattenhill, followed by breakfast at St Saviour’s.